Holland's first exhibition of the young American artist Jason Rhoades (Newcastle, California, 1965) will take place at the Van Abbemuseum. In recent years the work of Jason Rhoades has been shown at various places in the United States and Europe: at New York's Whitney Biennial (1995, 1997), at the Kunsthalle Base (1996), and at the Biennials of Lyon and Venice (1997). This exhibition is the first large-scale survey of Rhoades's work. Here, in a single, gigantic installation, the artist reflects on his work from the past seven years and the developments within it. Many works are presented in a new way in the installation and, as such, constitute a larger, new work. Among these are the works: Jason the Mason and the Mason Dixon Linea (1991), More Moore Morals and Morass (1991), Rhoades Construction (1993), Swedish Erotica and Fiero Parts (1994), Car Projects, Uno Momento. A Look to the Physical/Ephemeral (1996). 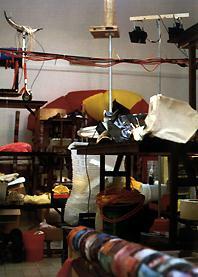 This 'reinstallation' will be shown in combination with the most recent work of Jason Rhoades, The Creation Myth (1998). In this the metaphor of the human body, more specifically the vital organs and the brain, is used for an examination of the basic principles of the creation myth. Rhoades uncovers the process of the mental handling of images, impressions and impulses. He asks himself why one thing is being stored in the brains and the other not. And also: what role do moral principles like good and evil play in this? For this large project the artist has been given the use of halt of the Van Abbemuseum's temporary build mg, a space in which all of the interior walls have been removed for the occasion. In this enormous open space, the various parts of the installation, often consisting of ready-made products that are available in stores, are interconnected. The artist uses the opportunity to elaborate on his metaphor of the human body. Seen together, the parts suggest an enormous digestion process. This is not a linear process where something goes in at the beginning and comes out at the end, but rather a rumination on the content, the objective being to reuse the art, make it digestible and accessible: a spiral with two flaps and two useless appendages. The art-historical roots of Jason Rhoades can be found in the work of Marcel Duchamp, in the Fluxus movement and the happening, but also in the radical statements of Minimal Art from the sixties. Rhoades shares a quest for the essence of the creative act and the meaning of artistry with his teacher Paul McCarthy. The accompanying publication has been carried out in the form of an encyclopedia, alphabetically arranged by keywords, and a supplementary dictionary. There are various ways to approach the work of Jason Rhoades. Despite this objective structure, the book reflects, of course, a subjective approach, if only due to the decision to use keywords. The exhibition has been organized in collaboration with the kunsthalle Nurnberg.